In the long and rich history of the Thoroughbred, there are pivotal stallions that became the standard of success by which all others would be judged. These stallions raised the bar so to speak. As generation after generation were born, the names of theses epoch sires were front and centre within the pedigrees of future Thoroughbred champions. St. Simon was one such stallion. To many, he was the epitome of the perfect race horse. He had the ability to pass on his class and brilliance to his get. Esteemed breeder’s such as Lord Derby, Federico Tesio, Claiborne Farm and Marcel Boussac would frequently, and purposely, inbreed to St. Simon in order to obtain his quality to their own bloodstock. This practice was nothing new in breeding. Eclipse, Stockwell, Herod, Matchem, Lexington, West Australian and other top class racers and sires before St. Simon were frequently inbred to. The extraordinary success of St. Simon as a sire, and the frequent success of inbreeding to him, bore proof of his reputation as one of the elite sires in Thoroughbred history. St. Simon came to his prominence due to his fashionable, for the day, pedigree and his unblemished racing record. To understand where he came from we must first look at his sire Galopin. Bred in 1872, Galopin was a bay horse by Vedette – Flying Duchess by The Flying Dutchman. He grew to be 15.3 hands. Galopin was bred in the purple as his classic winning sire was by the great Derby winner Voltigeur. His dam was by another highly regarded Derby winner. Flying Duchess was sold at the age of nineteen with her weanling foal Galopin for one hundred guineas to William Blenkiron of Middle Park Stud. Blenkiron then sold Galopin the following year in his annual yearling sale to Prince Gustavus Batthyany of Hungary for five hundred and twenty guineas. Sent to trainer John Dawson at Warren House, Newmarket, Galopin began his lessons for racing. He learned them very well as he won five of six starts as a two year old. His only defeat came in the Middle Park Plate to Plebian who was in receipt of eleven pounds from Galopin. As a three year old Galopin won all five of his races, including The Derby. He became the Prince’s most cherished horse in his stable. Galopin was retired following his three year old season due to fear of over exciting his popular proud owner. The Prince suffered from a serious weak heart condition. Normally Derby winners entering stud are well received by breeders looking to improve their stock. Inexplicably, Galopin was initially not highly sought after as a stallion. He was sent to William Barrow’s Stud near Newmarket with a stud fee of one hundred guineas. However he only covered a dozen mares in his first year. He was not very successful either as his first crop of foals were not of a high calibre on the track. His fee was then dropped to fifty guineas. Following the Prince’s unfortunate passing of a heart attack in 1883, Galopin was sold to Henry Chaplin. The price being eight thousand guineas. Galopin was transferred to Blankney Stud. By this time Galopin’s offspring were already beginning to show improvement on the race courses. Galopin eventually led the sire list three times. He ended up siring ten classic winners and was the broodmare sire of two English Triple Crown winners. His daughter Vampire, a mare with a vile temper who actually killed one of her foals, produced Flying Fox. This superb horse later sired Ajax who in turn sired Teddy, a major sire in France and America. Galopin sired Derby and St.Leger winner Donovan, his richest money winning offspring. He also sired 2000 Guineas winners Galliard and Disraeli. Furthermore Galopin sired 1000 Guineas winner Galeottia, and the undefeated champion St.Simon. Galopin died in June, 1899 at the age of twenty-seven. He had serviced full books of mares right up to his passing. One of Galopin’s first good horses was our subject St. Simon, foaled in 1881 from the broodmare St. Angela by King Tom. King Tom was a son of the legendary broodmare Pocahontas. St. Simon grew to 16.1 hands. He was a brown or dark bay horse of exceptional conformation. He carried his slightly dished head with a small white star high. His quarters were strong and his shoulders were just at a right slope. St. Simon had a girth of seventy-eight inches, and his cannon bone was eight and one half inches. If there was one complaint to his conformation, he did have a shorter than normal back. St. Simon was noted to have a smooth perfect galloping action. This trait was passed down to many of his get. Bred by Prince Gustavus, St. Simon emphatically won all nine races he competed. However, St. Simon was not eligible for the classics due to the death of his breeder/owner. The governing rules of the day prohibited classic nominees from entering if the owner was deceased. As a two year old, St. Simon was part of the dispersal of the late Prince’s racing and breeding stock. He was purchased for one thousand and six-hundred guineas by William Cavendish-Bentinck, the sixth Duke of Portland. The Duke moved the colt to the Heath House stables, Newmarket. St. Simon was placed under the care of Matt Dawson, brother of John Dawson. With legendary jockey Fred Archer up, St. Simon began his racing career at Goodwood. He won the Halner Stakes by six lengths in a canter. He went on to win four more races with considerable ease to finish his two year old season undefeated. Contesting only four official races as a three year old, St. Simon trounced all comers. This includes a twenty lengths shellacking of older runners in the Ascot Gold Cup. The field included Tristan, who was considered the best older horse in training that year. Due to his ineligibility for the classics, he had to take part in match races to prove his merit. Going against Harvester (Derby winner), Scott Free (2000 Guineas winner) and The Lambkin (St. Leger winner) he pulled away from all of them. Archer once said of him “He is not a horse but a blooming steam engine!”, when Archer could not pull him up from a speed trial. Attempts to race him at four proved futile as he developed nagging soreness to his shins. He was not pulled from training in time for the breeding season so consequently St. Simon did not start his stud career until he was five. And what a career he had! He sired ten winners of seventeen classic races. Highlighting his classic get are Diamond Jubilee who won the English Triple Crown and La Fleche, filly Triple Crown winner. St. Simon went on to become the leading sire in the UK for nine years during his illustrious career at stud. Hailed as the best stallion since the immortal Eclipse, St. Simon’s influence on the breed is still evident. Moreover, he became a sire of sires. This aspect to St. Simon’s stud career solidified his universal importance on the breed. St. Simon sired Persimmon, who won the Derby, St. Leger and the Ascot Gold Cup, and became a four time leading sire. He sired the great Sceptre and Prince Palatine. Sceptre is still considered as one of the greatest race mares in history. She captured four classics including the 2000 and 1000 Guineas on consecutive days. She is one of a very few to win the Fillies Triple Crown. Prince Palatine won several important races such as the Ascot Gold, St. Leger Stakes and the Coronation Cup. He is a direct tail male ancestor of Princequillo. Another son of St. Simon to win a classic and go on to become an important sire is St. Frusquin (2000 Guineas). St. Frusquin was a two time leading sire and sired unbeaten 1000 Guineas winner Quintessence. Other notables include Epsom Derby winner St. Amant, Epsom Oaks winner Rosedrop, and additional 1000 Guineas winners Rhodora and Flair. Additional St. Simon sons becoming leading sires include Desmond, who became another of the great stallion’s sons to lead the British/Irish sire list. Around the world, Diamond Jubilee went to Argentina to become a four time leading sire there. Pietermaritzburg led the Argentine list twice. Rabelais became France’s leading sire three times while Simonian led France twice. Soult went to New Zealand and proceeded to lead that country’s sire list five times. 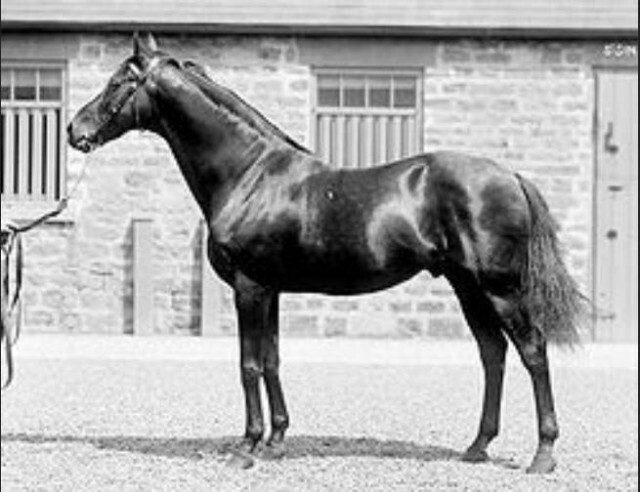 St. Serf was a consistent sire of classic winners. Still another son to have an impact on the breed, although he never led a leading sire list, was Chaucer. St. Simon was bred to the outstanding mare Canterbury Pilgrim in 1899. The resulting foal born in 1900 was Chaucer. He became the broodmare sire of Hyperion, Fairway, Pharos, Pharamond and Sickle. Each one of these five became foundation sires in later years. Canterbury Pilgrim also produced the influential future stallion Swynford, from the cover of John O’ Gaunt in 1907. Chaucer did lead the broodmare sire list twice and has had an enormous impact through his daughters. Daughters of St. Simon have been very important to blood lines of Thoroughbred champions. The aforementioned La Fleche won eight of nine races, including the Filly Triple Crown. Her only loss came in the Epsom Derby to Sir Hugo. La Fleche is the dam of John O’ Gaunt by Isinglass. As previously mentioned, John O’ Gaunt became the sire of the influential Swynford. St. Simon’s daughter Roquebrune produced Triple Crown winner Rock Sand by Sainfoin. Both of these grandsons became influential sires. Another daughter of St. Simon to have an important place in future bloodstock was Concertina. She produced the very influential broodmare Plucky Liege from a cover by Spearmint. Spearmint is a son of the great New Zealand bred sire Carbine. Plucky Liege is the dam of leading sire Bois Roussel, and the full brothers Bull Dog and Sir Gallahad III. The latter two established prosperous sire lines in America. Both became leading sires in America on multiple occasions. Plucky Liege is also the third dam of unbeaten Triple Crown winner Bahram. Bahram shows three crosses of St. Simon within the first five generations of his pedigree. To the most successful breeders of the first half of the twentieth century, St. Simon was the key to success. Breeders such as Federico Tesio, A.B. Hancock and his son Bull Hancock, Lord Derby and many more were always on the look for St. Simon in bloodstock purchase pedigrees. The conformation quality St. Simon was successful in passing down to future generations was the over riding factor. Tesio was also of the belief that St. Simon had the perfect blend of not only conformation, but also temperament and character as well. Successful breeders would inbreed to St. Simon whenever possible to double up on the traits they saw as the keys to a successful race horse. Future generations of champions descending in tail male line from St. Simon include Tulyar, Le Fabuleux, Princequillo, Round Table, Ribot, Alleged, Bois Roussel, Charlottesville, Sicambre, Gallant Man,Tehran and Pleasant Colony. Many of these future generation descendants were inbred to the great stallion. The St. Simon tail male line had strong representation for more than a century. Today these lines are in danger of fading away completely. Ribot and Princequillo were for many years the flag bearing carriers of the St. Simon tail male to the late twentieth century. Ribot descends from the Rabelais branch while Princequillo descends from the Persimmon branch. The branch descending from Chaucer had strong representation all the way to Gallant Man and Cougar II. St. Simon is considered as the prototype of the modern racehorse. In many opinions of the day, St. Simon had the right blend of spirit, racing class and conformation. Of his spirit his groom once said “It is very well to talk of the patience of Job, but Job never had to groom St. Simon”. He was more than difficult and he would pass on this spirit to many of his get. St. Simon’s influence cannot be overstated. His blood has been spread to all corners of the Thoroughbred racing world with incredible results. We may therefore consider him the first truly international stallion in the Thoroughbred world, even though he never left his native England. The most influential stallion in later years after St. Simon passed away became Northern Dancer. There are fifteen crosses of St. Simon within the first eight generations of Northern Dancer’s pedigree. To some this may seem redundant, but there must be some validity to the equation. St. Simon died in 1908 at the age twenty-seven. His skeleton was donated to the British Museum of Natural History. One of the most important sires in turf history, St. Simon is among the elite top five of all time. St. Simon was the best. Tesio was a genius and always inbred to him. Nearco and Ribot were his best and are both inbred to St. Simon. Enough said. as an apprentist jockey we had a lot of horses by Ribot’s son Ribolair, in hindsight we should have tried them over a distance, they didnt show any brilliance over short distance and we got rid of them. but they were very smart in the brain box thow. The greatest stallion of all time!! !